Thank you. Gracias. Mahalo. Dankeschön. Toda Raba. Domo Arigato. Your support and encouragement are fuel for our souls. The good things transpiring have energized me, brought me to tears of joy, and redoubled my determination to never give up, never surrender! I have learned from SDA Foundation that earmarking donations for "Academic Council-Robotics" is very important and this is done in the PayPal section. Checks work too! These can be sent to me (email me for details) or directly to the Foundation. In other news: The ratty-rats are fine. Betty is laying. Joe is still the world's oldest rabbit. Max is happy that this is conference week. William, Alex, Geoff and Max thought Avatar should have won an Academy Award in every category, including "Best Use of Sigourney Weaver," "Best Foreign Language," "Best Movie Ever Nominated." Geeks. Please keep praying, meditating, cheering, searching, supporting and celebrating with us. Thank you. photo credit to Denise B. Welcome to Chickenblog. Today I want to use this space to recognize, celebrate and promote FIRST and Team Paradox, of Team San Diego. 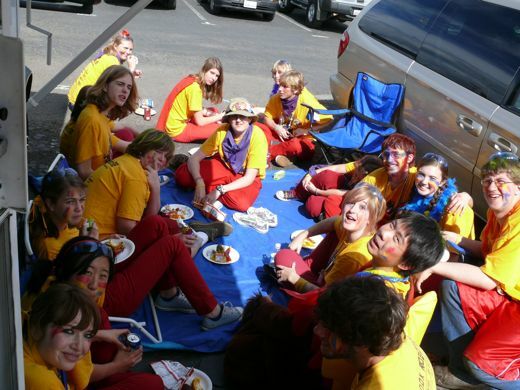 If you regularly read this blog, then you know I love Robotics and all things Geek. 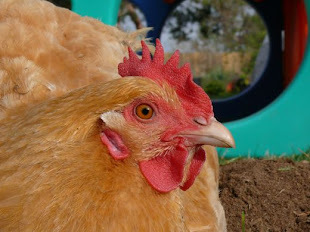 If you are new to Chickenblog... welcome to our family scrapbook, where for almost eight years, I have been chronicling our ups, downs, ins and outs, my deepest thoughts and other musings. This has always been a personal space, that has slowly expanded and grown. Now I want to go to another level in communication and outreach. I need your help to achieve my goals. In the last twenty four hours I have learned that dedication and heartfelt spirit can take a Team a very long way, but to get to the next level it takes daring faith and a willingness to reach out to the world for that extra push. I want to make the push. I cannot contain my emotions, or my determination to get 2102 Team Paradox to the next level. 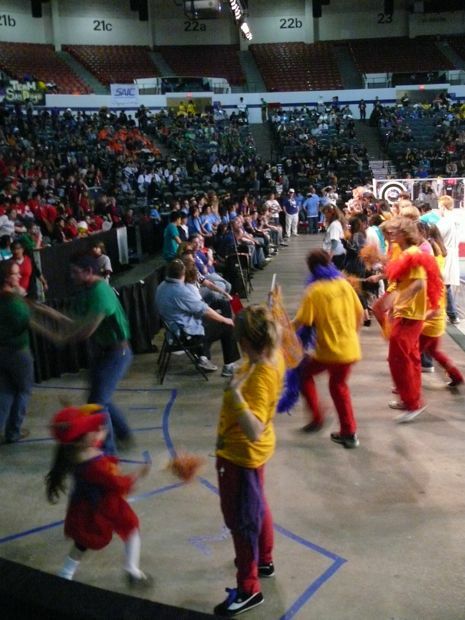 At FRC, this weekend, Team Paradox played Breakaway with diligent, tireless determination, and courage. Our robot held together and we are already preparing to breakout at our next regional competition. Were we discouraged not to make it to the final rounds? Yes, but we were not defeated. In the arena, across the grandstands, no one could miss the team that never sat down, that never stopped cheering, that never surrendered. 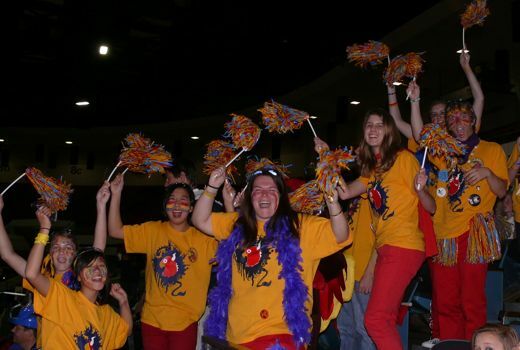 Team Paradox cheered for the underdog, for the math, for the mentors and parents, for the kids from across town, out of state and across an ocean. We cheered for the love of working together to build a robot and to build relationships with our families, our schools, our community and the world. And we did not stop until the end... and not really even then. We cannot ever lose, because there are so many ways to win, when you are a part of FIRST. This journey began when the team started over three years ago. Many of those founding team members have graduated and gone on to universities, but they have not moved away all together. Team Paradox has a lasting and supportive core of members that return to mentor, support and stay with the Team. When Alex joined last year, he was coming from another school in the district. He was warmly welcomed. 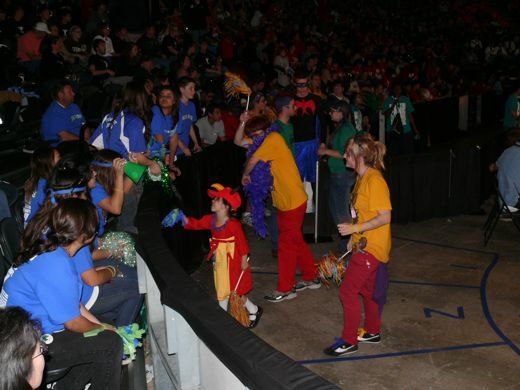 Last year, in San Diego we got our first taste of how amazing FRC is. The regional competitions have no equal for sporting-engineering fun. Wild, intense, fun. This year we have more new members than ever before, and the team is as strong as ever. The energy and determination of the freshmen class, combined with the experience and dedication of the rest of the team is a winning combination. We have mentors that are as steadfast and focused as the students, willing to step in, or step back. The mentors have staying power. 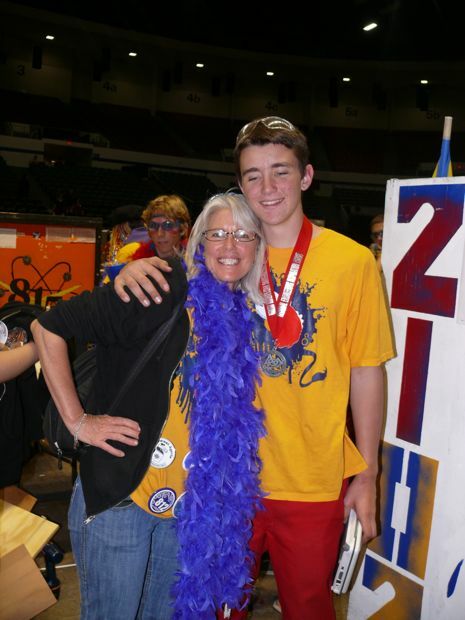 The team is supported by teachers, parents, siblings, the community, and some great sponsors. Last year we broke new ground and became an award winning team. 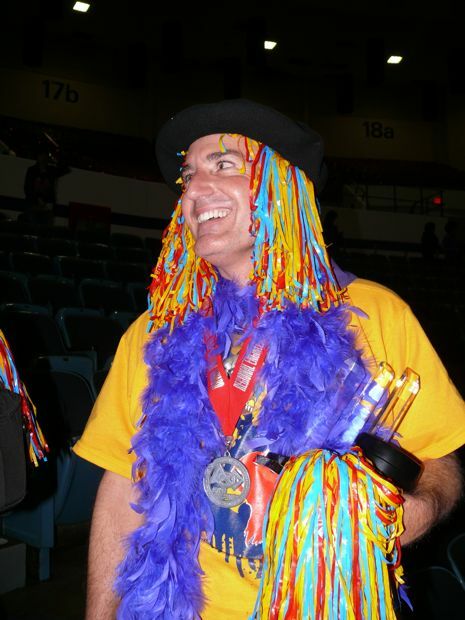 In San Diego and in Phoenix, Team Paradox 2102 won the Spirit Award :: "This award celebrates extraordinary enthusiasm and spirit through exceptional partnership and teamwork." We believed we had as good a chance at earning this award again... no kidding, you have not seen spirit until you have been with us through sixteen hours of regional competitions! We did not make it to finals. We did not win the Spirit Award. It was getting down to the wire, wrap up time. This year's Regional Engineering Inspiration Award to 2102 Team Paradox! I think we experienced all of the emotions last night, but mostly joy and shock. We were over the moon to be there. We were totally stoked to take home such a distinguished award. But the biggest news of all spread slowly. We were a bit confused actually... things got kind of surreal as it very slowly dawned on us that the "Regional Engineering Inspiration Award" includes an invitation to Finals in Atlanta, Georgia. 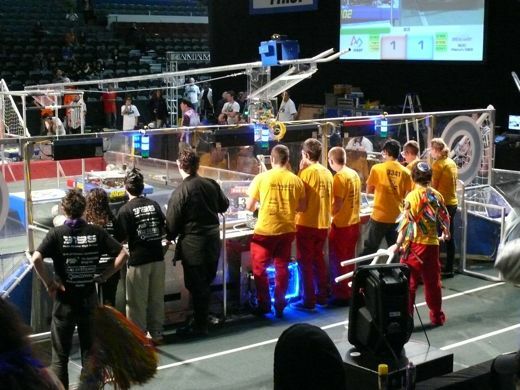 One more time: The Regional Engineering Inspiration Award includes an invitation to Finals in Atlanta, Georgia. Well, it can be for real. We can go to Atlanta and compete in the FIRST National Finals, but we are going to have to redouble efforts that have already been extreme. The students, teachers, mentors and families have given their best and it has paid off. The design team excelled. The build team excelled. The marketing team excelled. We gave 100%, so we could excel... we just didn't know it would take us this far! Team Paradox is about outreach, in our families, in our schools, in our communities, in FIRST. Team Paradox is about experienced members guiding and encouraging new members, so that our future is as strong as our foundation. Team Paradox is about believing in science and math, art and community, believing in our students, and loving all of it! Team Paradox is about supporting and nurturing everyone on the Team. I will never forget the power and awesomeness of these last few days, and I do not want to stop here. I do not want our memories to be a blur. I do not want to pass up an amazing opportunity. We need help to get this Team to Atlanta, to the Olympic Stadium. Our resources and energy are nearly tapped. We have one more regional to get through. These are huge events that take a lot of money, time, effort and brain power to coordinate. Please help us. I need your help to achieve my goals. All of this is going on while the students are in school. They have homework, testing, classes... the works, and unfortunately the school does not support the Team as "a team." In the eyes of the school we are "only a club." No disrespect, but "teams" get a lot of attention and support from their schools, and we need support. 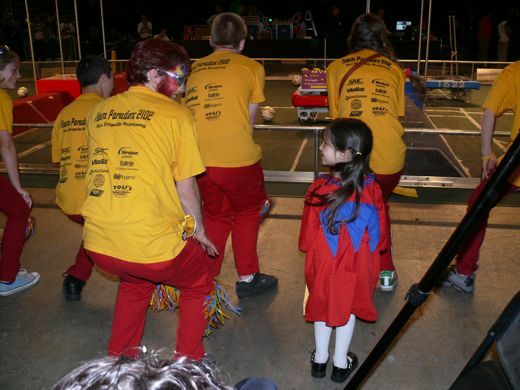 Our mentors, the teachers work their day jobs, and then they give all of their "free time" to Robotics. This next level, that we are so hopeful to reach, needs more support, for us to attain it. Chickenblog has a few readers out there... right? Hello. Hello? If you are out there, please leave a comment today. Please say "GO ROBOTICS!" Please move a ton of traffic here. Please suggest ideas and give advice. Please give me contacts and suggestions. Please step forward with your skills and connections. Please help us raise funds, get sponsors, and bring a winning team to Atlanta. We need you. Anything might help. 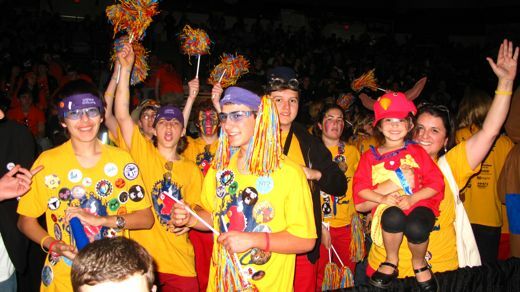 We stood and cheered for all forty eight teams in the arena, today I humbly ask you to cheer for us. Hey, what about selling those t-shirts...they are soooo cool! I was and still part of this team. I'm going to build a name for myself and bring back as much support as I can for the team I love so much! Or just spread the passion! Yeah! GO TEAM PARADOX!! !